A relatively obscure, often overlooked G1 character, Topspin was brought screaming into the spotlight thanks to the ever excellent “Last Stand of The Wreckers”. Sharing a similar body with his brother Twintwist but equipped for aerial reconnaissance and combat rather than ground demolitions and exploration this Wrecker is a serious threat to the Decepticons. 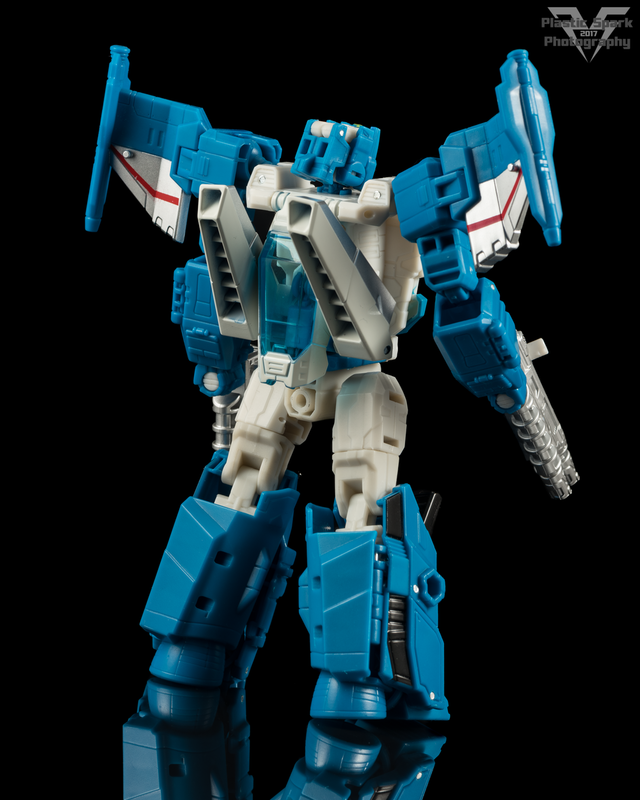 While his brother is still awaiting release in the next coming wave of Titans Return, Topspin here has arrived amid the wave 4 deluxes and is an absolute gem of a figure, easily the best, and most stand out figure of the wave for me, and in my opinion, the star of the entire line so far. Yes, I even like him more than Triggerhappy who I absolutely raved about (and still will truth be told) although that debate is certainly a worthwhile one. I’ll point out a few of my reasons in the review. Topspin’s alt mode is a fun, sci-fi space ship that would look absolutely at home among the arcade heroes of Galaga, Space Invaders, and Galaxian. I don’t know what it is about this particular vehicle mode but I absolutely love it. The translucent cockpit is lovely, and something about that dual nose design is just a ton of fun. One of my favorite things about Topspin is that in alt mode or robot mode he is very solid, with few if any large hollow sections. This is where I give him points over Triggerhappy. While Triggerhappy is absolutely gorgeous from the front he’s a bit lazy looking when viewed from the rear with his thighs visible and a ton of hollow space. Topspin solves a lot of this issue thanks to how his legs transform, leaving him with large rear thrusters on the back, and only the slightest gap in the side panel. Rounding out the final features of the alt mode, he has titan master pegs on his wings, and flip out landing gear up front, with two small tabs on the underside that act as landing struts when the gear is deployed. The Titan Master (Freezeout) included with the figure is fairly basic, lacking any paint on the robot mode. I’m not entirely sure who it’s supposed to reference but the head sculpt looks like Topspin, wearing an air intake mask similar to a human fighter pilot. I’ve mentioned it to a few of my friends already, but I feel like posting it here as well just in case it happens. I can easily see a Saber (Star Saber) retool out of this figure. The existing head is already a dead ringer, and bot mode is pretty darn close. The vehicle mode even has a very similar rear end with Saber’s signature vents/boosters and simply tooling some sort of removable central nosecone/shield piece would complete the look. At the very least I would expect to see some customs if Hasbro or Takara don’t capitalize on this one. The transformation from Vehicle to Robot is incredibly fun and intuitive. In my opinion instructions are absolutely unnecessary but be careful not to force anything if you are trying to work it out for yourself. There is a marvelous moment that occurs regarding the chest but I don’t want to go into too much detail as I feel this is a lot of fun to experience in person. Even if you don’t want to buy this figure, try to at least get your hands on one just to transform. (Though you’ll probably end up wanting one after. Don’t blame me! Or do blame me I suppose… that’s the point of this review!). This is one of the coolest transformation schemes I’ve seen in quite a while and I’m looking forward to seeing more figures made from this mould. Misfire, Slugslinger, and of course Twintwist all spring to mind! 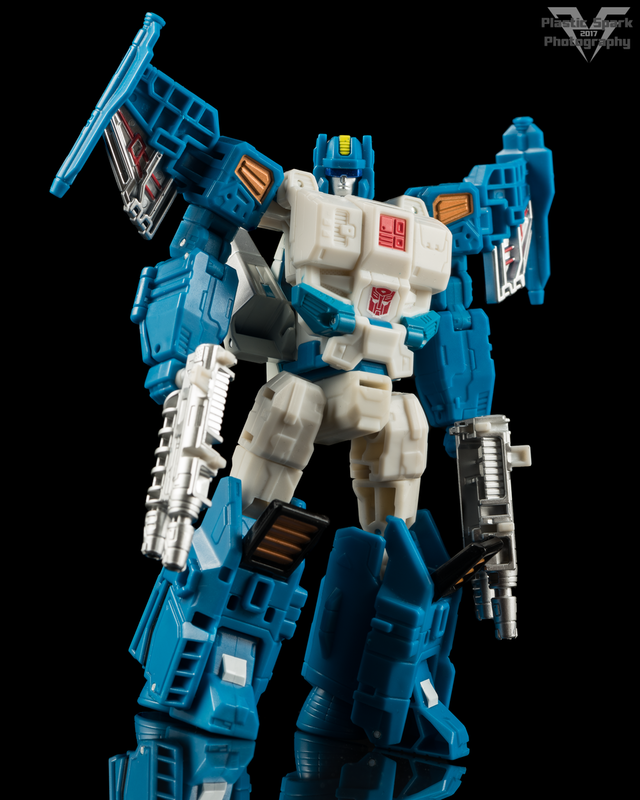 Topspin’s bot mode looks like a stocky, giant booted, Decepticon stompin’ space trooper. He looks awesome, with great heroic proportions and much like the alt mode, very few hollow spaces or visible kibble. His transformation style allows both his forearms and his lower legs to be filled in which is another reason that I give him points over Triggerhappy. While the plastic quality isn’t quite the same as it used to be, this design really throws me back to the days of Classics and Generations before the big budget cuts. I suppose the “backpack” area could be a bit cleaner, however I really like the way his nosecones have venting detail on the bottom making them look kind of like a jetpack or maneuvering device similar to a Mobile Suit! Topspin’s articulation is fantastic for a figure of this size and price point with the only “essential” piece of articulation missing being an ankle tilt. He’s got ball joint shoulders with a great range thanks to their use in the transformation, as well as double elbows that can curl all the way tight to the bicep/shoulder. There is no wrist swivel but this really should come as no surprise to anyone at this point. Given how his hands fold in and that he has forearm covers I’ll let this one slide. He has a full waist swivel, and if you disconnect his transformation clip you can even fake an ab crunch for specific poses. This can look a bit awkward if you’re not careful but I personally consider it a useful side effect of the transformation. He’s got ball joints at the hips that allow for a full 90 degree range of movement front, back, and to the side, as well as thigh swivels. His knees fold to about 90 degrees due to the calves on his legs being filled in with his rear thrusters from alt mode. The design of the legs and knees allow him to kneel perfectly which is enough for me as many figures cannot pull off this incredibly simple pose. Ankle tilts would have been nice but given the transformation of the legs I don’t really see any feasible way to add this feature. You can angle the foot up a little bit for walking poses, however this will start to transform his legs so be careful with that. His feet are massive and even at an angle typically provide him with a very stable base. Aside from his Titan Master partner, the other accessories included are 2, twin barrel blasters painted in a shiny silver. 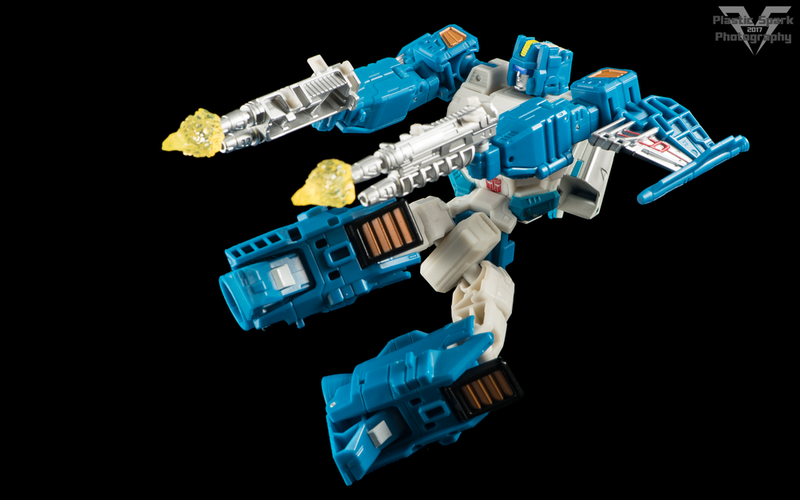 The blasters can be held in Topspin’s hands, mounted on his wings in either mode, and can also be clipped together to create a wide 4 barrel blaster weapon. You can also sit a Titan Master in this combined weapon mode if you like. I’m prone to gushing perhaps a little too much when I really enjoy a figure, and this might be one of those cases but I truly, genuinely enjoy this Transformer. Twintwist is a bright spot among the already quite remarkable Titans Return toy line and I absolutely recommend getting your hands on one if you can! Let me put it this way… I’m even thinking about getting rid of my Mech Ideas versions in favour of this mass release from Hasbro. That’s how much I like it! Though I’ll likely hold on to those little guys as their aesthetic works a little better with the other MMC Demolition Crue, this version of Topspin is absolutely my recommendation if you are in the market for a toy of this character. Let me know what you think in the comments, and don't forget to check us out on Facebook! If you have a question or comment that requires a prompt response please don't hesitate to message me on Facebook or email me at plasticsparkphotography@gmail.com as it's much easier and quicker for me to respond than in the comment section here! Thanks for checking out the review and I'll see you guys soon with more!